Even though Magic Girl is still fresh in our memories, we already have another of Super Fighter Team’s Mega Drive (Genesis) titles to offer you next. Cascade doesn’t involve witches or any grand battles, except a battle of wits. This dice based puzzle game is one of those games that looks extremely easy at first, but does manage to put your gray matter to work. Snake eyes won’t do you any good in this domino-like game. 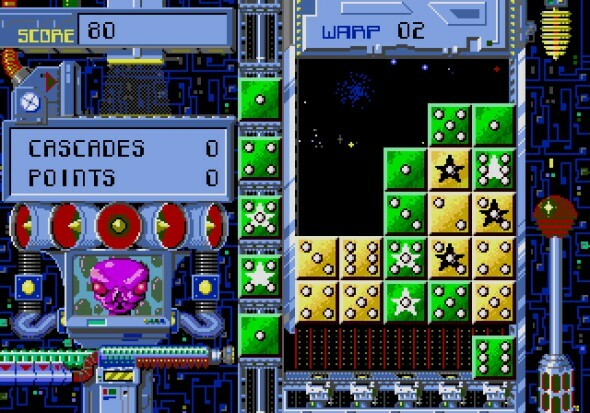 As the game falls in pretty much the same category as titles such as ‘Columns’ it was to be expected that no elaborate plot would be present in Cascade. Nonetheless, the game does have a bit of a background, as you find yourself on the planet of Cascadia, where the game of Cascade is probably even more popular than football, soccer, baseball and hockey is for us, all together. The game does bring people together, but it also is a breeding ground for rivalries and each time the difficulty rises, you’ll be fighting a new opponent, which also has a bit of a background, albeit in the manual that comes with the game. While graphically Cascade doesn’t throw that many special looking items in your face, it looks good, keeping the goal of the game in mind. 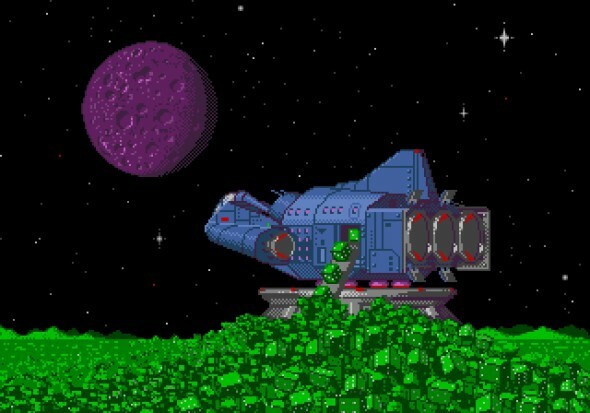 You’ll simply get your playing field, which treats you to an intergalactic view, the green dice you’ll have to place on the playing field and your ‘enemy’ which is simply a static pixilated photo of their mug. Overall things look good, but the game lacks a bit of diversity, especially when you warp up (reach a more difficult stage), the background doesn’t shift. Even though this isn’t a big deal, and the facial shot of your opponent does change, it’s such a small difference that would have given the game a nice touch nonetheless, or would have made it truly feel as if you had entered a new part of the game. Puzzle games, especially retro ones, often had a god-awful soundtrack that made you mute the game after a short period of time, simply so you could focus on the puzzles at hand again. Cascade doesn’t have an annoying soundtrack at all, repetitive as it may be. The only remark here might be that the song you hear on loop would suit a game like ‘Transport Tycoon’ more, than it does this title. That being said, the tune has a certain ring to it, that is more or less captivating. Sound effects are presented in a fairly standard fashion, while the game over sound might be a tad too loud, but we reckon it has to do with the game trying to stress you out even more. You’ll also sometimes hear an ‘alien’ voice speak to you, in a rather creepy way. Cascade is a puzzle game where you’ll have to form ‘cascades’ in order to rack in points and get ahead of the competition. Cascades are pretty much pairings of at least four consecutive orders, in straight lines, swerving lines, or other patterns, as long as they are not linked in a diagonal fashion. Other cascades can also be pairings of four or five times the same number, but these have to be in a straight line. That’s pretty much all there is to the game when it comes to its goal, and simple as it may sound, it is a lot harder than you’d initially expect. 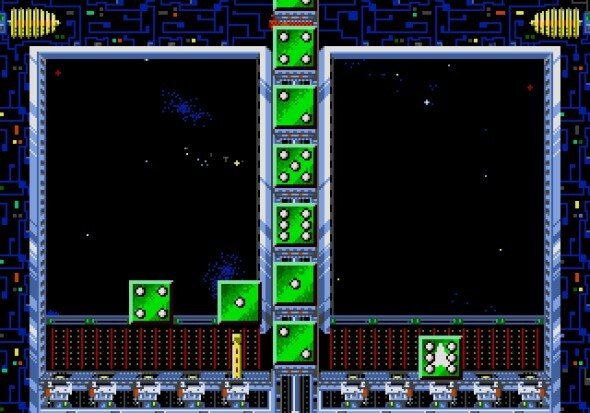 Your playing field will consist out of five columns and six rows, and each time you get a dice, you’ll be able to shove it in one of the columns, from the bottom. This means that, if you place a dice in the second column, when there is none, it will be the only one, but if you place one after that, you’ll push the one already in there up. When a column has six dice in it, you’ll either have to get rid of some by creating a cascade, or wait until one decays. Waiting however, makes the bar (your time) drop, and when it falls down completely, it’s game over. Keep in mind that you can’t put two dice with the same value in the same column after one another. Overall things are simple to work with, but a lot harder to get proper combinations and even harder when you start ‘warping’ up. You’ll immediately notice that the second warp is already a lot harder than the first and so on. It’s quite fun to see a multiplayer mode in a game such as this, where two players are competing against one another. You’ll get dice from a collective pool, thus, if you plan your moves right, you can hijack certain dice and vice versa. You’ll have to aim for bigger combos, as you’ll have to gain a lot of points to tilt the meter in your favor, and if you’re able to get it all the way to your opponents side, you win the match. Skilled players can raise the difficulty when playing against beginners, making sure that the newbies aren’t killed too fast. Nonetheless, it’s best to keep things rather equal, as after a match or two you’ll be evenly matched. Cascade is a great title in its genre, but an amazingly hard one, if you wish to defeat all the different opponents the game throws at you. Nonetheless, the gameplay is very accessible for new players, and all tends to dwindle down to a keen eye and a hefty dose of luck. If you’re into Columns and other combination puzzle games, this one might not offer precisely the same experience, but it will certainly offer a very nice alternative, with some similar bits and bobs.